Mineral elements are found in foods and drink of all different types, from drinking water through to mothers’ milk. The search for mineral elements has shown that many trace and ultratrace-level elements presented in food are required for a healthy life. By identifying and analysing these elements, it is possible to evaluate them for their specific health-giving properties, and conversely, to isolate their less desirable properties with a view to reducing or removing them altogether from some foods. The analysis of mineral elements requires a number of different techniques – some methods may be suitable for one food type yet completely unsuited to another. 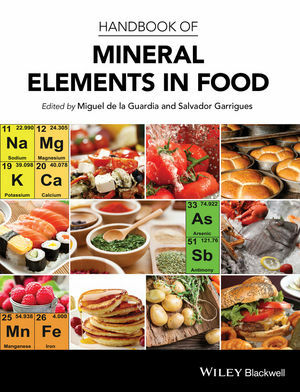 The Handbook of Mineral Elements in Food is the first book to bring together the analytical techniques, the regulatory and legislative framework, and the widest possible range of food types into one comprehensive handbook for food scientists and technologists. Much of the book is based on the authors’ own data, most of which is previously unpublished, making the Handbook of Mineral Elements in Food a vital and up-to-the-minute reference for food scientists in industry and academia alike. Analytical chemists, nutritionists and food policy makers will also find it an invaluable resource. Showcasing contributions from international researchers, and constituting a major resource for our future understanding of the topic, the Handbook of Mineral Elements in Food is an essential reference and should be found wherever food science and technology are researched and taught. Miguel de la Guardia is, since 1991, Professor of Analytical Chemistry at the University of Valencia (Spain), having published numerous papers in the area of Analytical Chemistry related to sample preparation, automation, atomic and molecular spectroscopy and chromatography. Salvador Garrigues, is Professor of Analytical Chemistry at the University of Valencia (Spain) since 2006, being developed his research about sample preparation and, mainly, in the field of vibrational spectroscopy applied to the quantitative analysis, combined with automation and the use of chemometrics. Their research group has contributed to the development of Green Analytical Chemistry and participated in different research projects focused on food characterization and food safety, also for authentication of Protected Designation of Origin (PDO) foods.